"I hear that you are the church that gets things done in the community, so I thought I would ask you first." I’m sure you have heard it said that you never get a second chance to make a first impression. The experts tell us that within seconds of meeting someone, we have made our minds up about what that person is like. That is why the way we welcome people into our churches really matters. In fact, I would say that it extends beyond how we welcome people into the church and into how our Church is perceived in our community. When we were commissioned to replant the 85-year-old church in Cinderford, which had dwindled to six ladies of 80+ years, there were various perceptions in the town about the church that we needed to both harness and overcome. We could harness the fact that the church did an excellent job with children in the 1950s and 1960s, speaking to those who lived nearby aged 60+, and it was not long before we heard stories of happy times at the old Gospel Hall where, as children, they were welcomed and accepted by the Church. Some of those people have now joined us and become our most enthusiastic members all these years later. However, there were perceptions we needed to overcome, the community viewed the church as a quaint set up, with a musty smelling building, archaic language and indifferent music which only reinforced the stereotype that the Church was out of touch, not relevant and only really welcomed you if you were willing to conform to their Church culture. I well remember the day 12 months into our time here, when a local newspaper reporter found her way into the church just after we had made a few changes to the interior of the building. I took the opportunity to explain that the vision was to reach out into the community and help people to see Jesus and church were relevant today. With that, she took one disdainful look around the main hall and replied, “Well, I can see you have a long way to go and abruptly left! Contrast that with a recent response 12 years later, when a local councillor walked into the church asking for help to integrate and welcome Syrian refugees into our community. His first comment was, “I hear that you are the church that gets things done in the community, so I thought I would ask you first.” How we thank God for this miracle of transformed perceptions. What have we done to bring this change without watering down the Gospel message? 1. Engage: We have taken every opportunity to engage with the non-churched community around us to share the love of Christ. This has been done through engaging with the disadvantaged, the debt-ridden, the hungry, with young parents, schools and community groups as well as our MP, chair of the town council, and other leading lights. It’s the principle that ‘people don’t care how much you know until they know how much you care’. Once the community starts to get the message of how much you care, suddenly the atmosphere changes. 2. Premises: As funds permitted, we renovated our building using natural timbers and modern colour schemes as well as recently extending and adding parking. 3. Music: The first thing we did was ditch the organ and fostered musical talent we had, which was in two 11–13 yr old children. Today, we have a music team of 17 highly gifted musicians. Like attracts like, and if you want young people, you need music that they can relate to. 4. Child-friendly: Accept that children will be seen and also heard! We don’t embarrass parents of noisy children by staring disapprovingly, we welcome them. By creating this kind of culture, it opens up so many doors in the local community for us to show the unconditional love of Christ and share the gospel in actions and words. 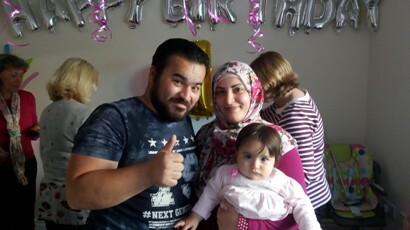 We have now been able to furnish the home of a Syrian refugee family, provide personnel to teach them English and help the husband find work. This has now extended to a couple of Kurdish Turk/Iraqi families and also to an Italian family, as the Good News spreads and people know they are truly welcomed and accepted.